You’ve bought an Arduino starter kit Getting Started With Your Arduino Starter Kit - Installing Drivers & Setting Up The Board & Port Getting Started With Your Arduino Starter Kit - Installing Drivers & Setting Up The Board & Port So, you’ve bought yourself an Arduino starter kit, and possibly some other random cool components - now what? How do you actually get started with programming this Arduino thing? 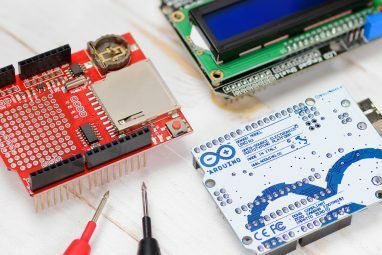 How do you set it up... Read More , you’ve followed all the basic Arduino guides, but now you’ve hit a stumbling block – you need more bits and bobs to realise your electronics dream. Luckily, if you have an Arduino board, you can simply stack functionality on top in the form of Shields. Shields are specifically designed for the Uno board to be the same shape and pin alignment; you simply plug them on, and you have instant upgrade of functionality. Before you buy, be warned: the Ethernet shields are version specific. I purchased a v3 one only to find it wouldn’t fit on my v2 Uno board – two additional pins were added in v3 of the Uno. 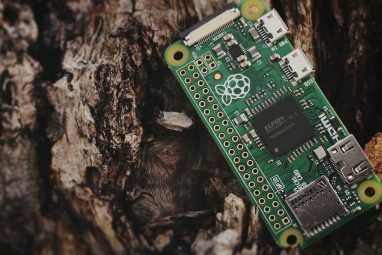 Since the Ethernet Shield is actually more expensive than the Uno, if you find yourelf in this situation then the simplest solution is just to buy a new Uno to use with the Ethernet, then keep your old board for other projects. Or you could just check the version number on the back of your board before buying, but where’s the fun in that? Warning: In the picture above, I’ve used stackable pin risers to avoid contact with the USB port. The legs from the relay protrude slightly underneath, and if carrying a high voltage, are likely to fry your Arduino, or even worse, your computer. Some people use insultating tape to cover the legs instead. 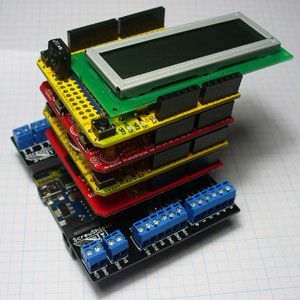 Bear in mind that not all shields are fully stackable; some will need to go on the top of the stack as they don’t provide pins on top (or don’t make sense going in the middle of the stack, like an LCD screen). 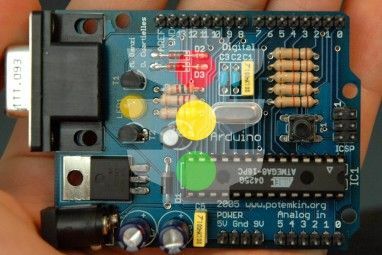 Are you just getting started with an Arduino? No problem, we have quite a few cool tutorials here for you to try. Have you used an Arduino shield? If so, let us know in the comments which one and what you built with it! You're right, it could do with an update. It is great stuff! Could I post it in wiznetmuseum.com? Actually I work for WIZnet which designed W5100, W5500 in Ethernet shield. Thank you! Really great project that is missing is the Smart Citizen project! Good to see them go viral worldwide. A lot of people from around the world want to get their hands on one or more Smart Citizen kits. Most of this stuff you can get for a third of the price on ebay. I got an ultrasonic sensor for 2 bucks, free shipping.